beautiful cartoons in all your posts.I realy like you blog. Well now days your posts are better than MBT (in the absence Mohammed).Thanks for sharing good articles. This is great, and a good blog too! really good of you to share. I have been playing with the ticker and increased the height, but can't seem to figure out how to get the text scrolling across the middle, instead of aligned to the top? 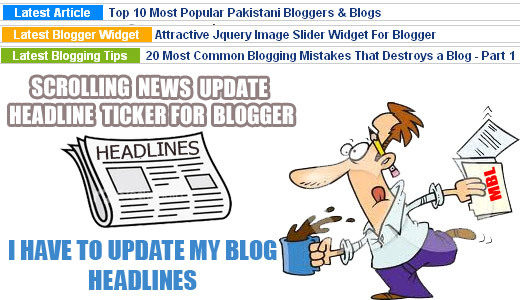 hey syed faizan ali can u tll me i have installed a new template in blogger blog now there is no opttion to view older and newer post in the template can u tll me how to install it. Hey buddy i simply love it. Can we adjust also its height? Check it out on my blog and let me know. Thanks! Btw it works properly only with chrome and firefox. With IE is weird. Any solution? IE is sluggish and old browser, no one use it these days! I'm having serious issues with my marquee. My webpage (blog) usually delays for few seconds when loading and during the delay, the contents of the marquee spills over the marquee and covers other contents of the webpage. After the webpage has loaded completely the marquee adjusts itself and the spilled contents rearranges inside properly. Is there a way out? Unfortunately, this widget is not robust enough to support these fancy things. please one more thing ! what if you want it to scroll upwards instead of sidewards how do you do it ? Amazing, But i want news update widget which is automatically update recent post. Not enter any url for the further post. how can I use this widget without Links? Is there a way to make this code to automatically take posts from recent posts?